Bowling, in cricket, is the action of propelling the ball toward the wicket defended by a batsman. A player skilled at bowling is called a bowler; a bowler who is also a competent batsman is known as an all-rounder. Bowling the ball is distinguished from throwing the ball by a strictly specified biomechanical definition, which restricts the angle of extension of the elbow. A single act of bowling the ball towards the batsman is called a ball or a delivery. Bowlers bowl deliveries in sets of six, called an over. Once a bowler has bowled an over, a teammate will bowl an over from the other end of the pitch. The Laws of Cricket govern how a ball must be bowled. If a ball is bowled illegally, an umpire will rule it a no-ball. If a ball is bowled too wide of the striker for the batsman to be able to play at it with a proper cricket shot, the bowler's end umpire will rule it a wide. There are different types of bowlers, from fast bowlers, whose primary weapon is pace, through swing and seam bowlers who try to make the ball deviate in its course through the air or when it bounces, to slow bowlers, who will attempt to deceive the batsmen with a variety of flight and spin. A spin bowler usually delivers the ball quite slowly and puts spin on the ball, causing it to turn at an angle while bouncing off the pitch. During the 1760s and 1770s it became common to pitch the ball through the air, rather than roll it along the ground. This innovation gave bowlers the weapons of length, deception through the air, plus increased pace. It also opened new possibilities for spin and swerve. In response, batters had to master timing and shot selection. One immediate consequence was the replacement of the curving bat with the straight one. All of this raised the premium on skill and lessened the influence of rough ground and brute force. It was in the 1770s that the modern game began to take shape. The weight of the ball was limited to between five and a half and five and three-quarter ounces, and the width of the bat to four inches. The latter ruling followed an innings by a batter called Thomas "Daddy" White, who appeared with a bat the width of the wicket. In 1774, the first leg before law was published. Also around this time, a third stump became commonplace. By 1780, the duration of a first-class cricket match was generally three days, and this year also saw the creation of the first six-seam cricket ball. In 1788, the MCC published its first revision of the laws, which prohibited charging down an opponent and also provided for mowing and covering the wicket in order to standardise conditions. The desire for standardisation reflected the massive increase in the popularity of cricket during the 18th century. Between 1730 and 1740, 150 cricket matches were recorded in the papers of the time. Between 1750 and 1760, this figure rose to 230, and between 1770 and 1790 over 500. Australian fast bowler Brett Lee in action in 2005. Originally, this definition said that the elbow joint must not straighten out during the bowling action. Bowlers generally hold their elbows fully extended and rotate the arm vertically about the shoulder joint to impart velocity to the ball, releasing it near the top of the arc. Flexion at the elbow is not allowed, but any extension of the elbow was deemed to be a throw and would be liable to be called a no-ball. This was thought to be possible only if the bowler's elbow was originally held in a slightly flexed position. Jim Allenby in midflight, illustrating the position of the body during a delivery at the end of a run up, prior to bowling the ball. Other areas of the pitch may also often be used as a variation to a good length delivery. Primarily these are the yorker, in which the ball is bowled directly at the batsman's feet as a surprise delivery intended to dismiss the batsman bowled, and the bouncer in which the ball is bowled on such a short length that it rises towards the batsman's throat or head as a means of physical intimidation. But the height of an attempted yorker or full toss must not be higher than the batsman's waist, or else it will be called a no-ball beamer, which could have bowlers banned from the match. The velocities of cricket bowlers vary between 40 and 100 mph (64 and 161 km/h). In professional cricket, a bowler in the 40–60 mph range would be said to be a slow bowler, in the 60–80 mph range a medium pace bowler, and a bowler 80 mph+ a fast bowler. In the amateur game, these distinctions would be approximately 10 mph slower. Many professional fast bowlers are able to reach speeds of over 85 mph, with a handful of bowlers in the world able to bowl at 95 mph+. The ability to react to a cricket ball travelling at 85 mph is a skill that only professional and high level amateur cricketers possess. The pace of a bowler not only challenges the reaction speed of the batsman, but also his physical courage. Fast bowlers are able to exploit this by bowling bouncers, either regularly or as an occasional surprise delivery. In limited overs cricket, there is a limitation on the number of overs each bowler can bowl. This number depends on the match length, and is usually 20% of the total overs in the innings. For example, the usual limit for twenty-over cricket is four overs per bowler, for forty-over cricket eight per bowler and for fifty-over cricket ten per bowler. There is, however, no limit on the number of overs each bowler may bowl in first-class cricket matches, except that no two overs can be bowled consecutively thus restricting any one bowler from a maximum of 50% (plus 1 over) of each innings total. The rule also applies in terms of breaks within a Test innings (Drinks, Lunch and Tea breaks, end of day and beginning of next day). The rule can only been broken if one finishes the end of the previous match starts the next match. 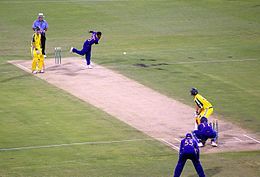 Wikimedia Commons has media related to Bowling (cricket). ^ "Laws of Cricket: Law 42 (Fair and unfair play)". Lords.org. Archived from the original on 5 January 2013. Retrieved 23 January 2013. ^ "Laws of Cricket: Law 24 (No ball)". Lords.org. Archived from the original on 27 December 2012. Retrieved 23 January 2013. ^ "Laws of Cricket: Law 25 (Wide ball)". Lords.org. Archived from the original on 24 November 2012. Retrieved 23 January 2013. ^ "Fastest delivery of a cricket ball (male)". guinnessworldrecords.com.